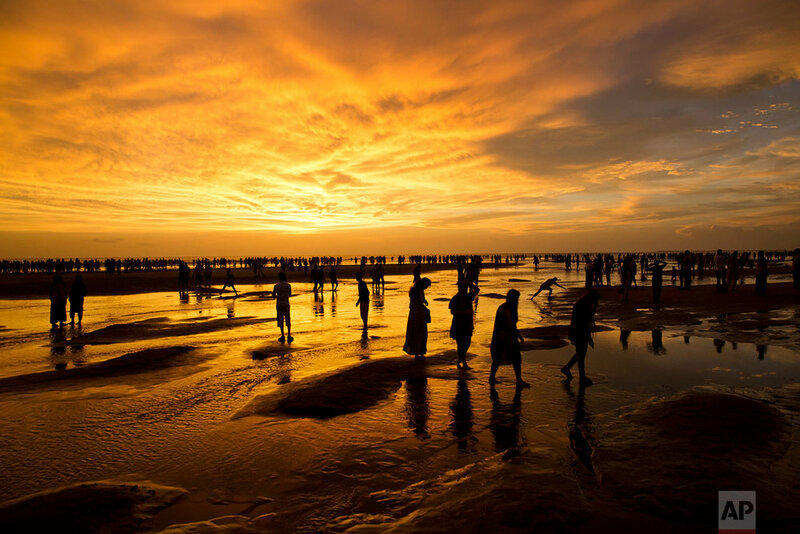 On the miles-long beach that makes this Bangladesh’s top tourist destination, thousands of people picnic and splash in the water. There are balloons and cotton candy for the kids, fried snacks and tender coconuts for the rest. Families sit under umbrellas. Young couples find quiet moments. Travel just 25 miles (40 kilometers) south past lush green paddy fields lining the coast and a different scene emerges. Vast areas are now entirely taken over by a sea of makeshift bamboo and plastic tents. These are homes for many of the more than 430,000 Rohingya Muslims who have fled to Bangladesh with stories of terrible persecution in Buddhist-majority Myanmar. 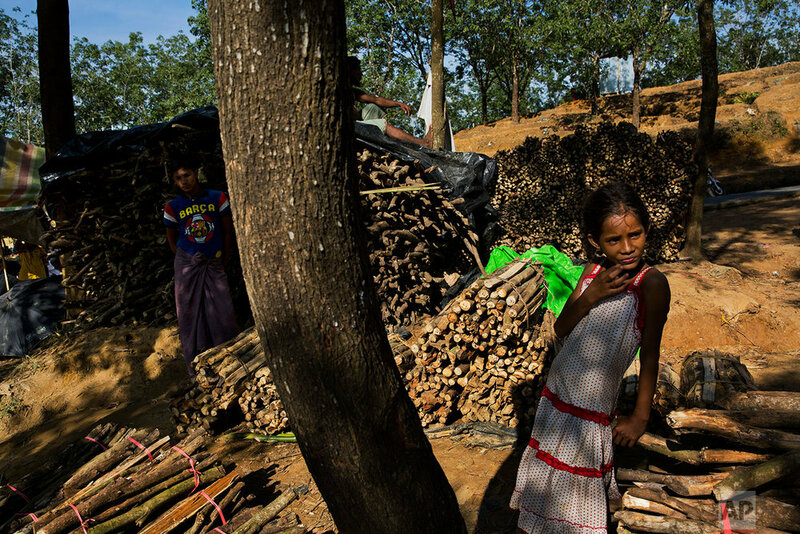 The new arrivals spill out of refugee camps for Rohingya that have existed in this border district since the 1990s. But no previous exodus has been as enormous as the one that began a month ago on Aug. 25, when the latest convulsion of violence erupted in Myanmar. Refugees flooded unceasingly across the border during the first three weeks as Myanmar troops embarked on what they called “cleansing operations” to target Rohingya insurgents after a series of coordinated attacks on dozens of police posts in Rakhine state. The tide of refugees has slowed to a trickle for now, but they still come by land and by boat on the Naf River, which runs between Myanmar and Muslim-majority Bangladesh. Most are starving and sick. 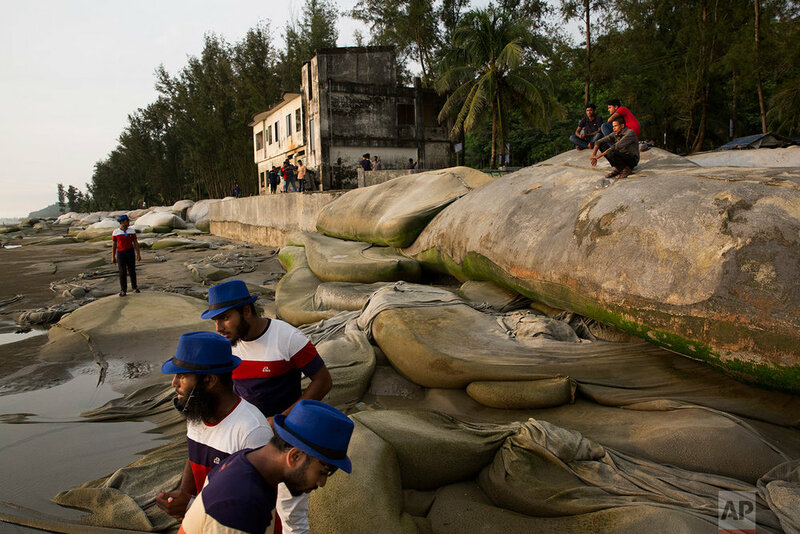 Residents of Cox’s Bazar have helped with relief efforts like handing out food and water. But with so many new arrivals and the prospect of more to come, they are growing nervous about the future. A colorful bazaar known as the Burmese market sits at the entrance to the beach, among the longest unbroken stretches of sand in the world. Shopkeepers are almost all Bangladeshi, but the stores are packed with goods from Myanmar. Several are devoted pungent, dried fish. In others sit boxes of tamarind paste and packets of candy and peanuts. The closeness to Myanmar — or Burma, as people here still call it — has meant that tastes and language have mingled for generations. Most people understand the dialect of the Rohingya, and the linguistic similarities only grow further down the coast near the border. That doesn’t mean locals accept the new arrivals gladly. “We are becoming a minority in our own place,” complained Arshad Khan, a 28-year-old shop owner. “They are not educated at all. They can’t live together with us,” said fellow shop owner Rashidul Islam. “They start fights and quarrels all the time,” he added — though he acknowledged he has never been in an argument with refugees himself. It’s crowded and dusty outside a row of hotels. Open drains crisscross the streets. Garbage sits piled on street corners. There are few cars, but the traffic is chaotic — a crush of cycle rickshaws, tuk-tuks and two-wheelers. The biggest predators on the roads are smoke-belching, horn-blaring buses that are packed to bursting point. Cox’s Bazar, named after an 18th Century official in the British East India Company once posted to the area, isn’t rich by any means. Apart from tourism, which mostly attracts Bangladeshi visitors, small businesses and government jobs are the main sources of income. People worry what the population explosion will mean will mean for the already low wages many Bangladeshis here count on. The roads between the refugee camps are utter bedlam now, noisier and more chaotic than ever before. SUVs rush aid workers up and down the highway. Motorcades of government officials — their car lights flashing and sirens blaring — arrive to inspect the camps regularly. Knots of refugees run after any vehicle that slows down in the hope of getting a few taka (pennies) or something to eat. 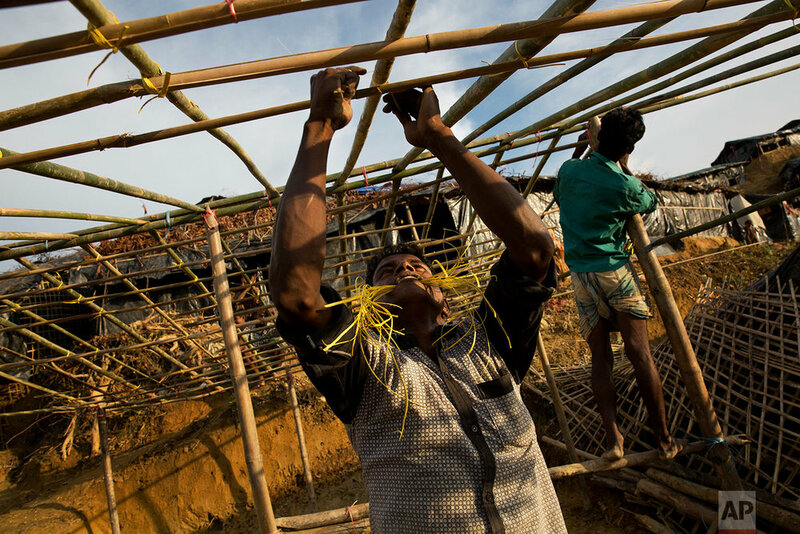 Balukhali camp, recently created to house the newcomers, is a shanty town of black plastic roofs propped on bamboo poles as far as the eye can see. Inside each is only the sparest of personal belongings: pots, plates and cups, a bag or two of clothes and a plastic mat to sleep on. There was no running water at first, leaving children to fill plastic bottles from muddy drains. Things are slowly improving. Aid agencies deliver massive plastic containers of drinking water, and a few public toilets have been erected. Most camps now have medical workers visiting regularly. It’s hardly enough, but it’s a start. Aid agencies say the scale of the flow caught them off-guard and left them scrambling to scale up relief efforts quickly. “We would hire new staff and by the time that was done a hundred thousand more people had come,” said Suchismita Roy, a spokeswoman for the aid group Action Against Hunger. Now a rudimentary order is beginning to emerge. Bangladesh’s government has begun giving refugees biometric identification papers to help with distributing aid and medical assistance. Around 10,000 people now have laminated ID cards with their photographs, fingerprints and a bar code. Thousands more line up to get papers each day. And slowly, the rhythm of life in these camps is changing. Local Bangladeshis, worried as they are about the sheer number of newcomers, are finding that within slum life too there are spaces for commerce. But there’s a dark side to conducting business, with slum lords charging refugees at least 2,000 taka ($24) for space to build a shelter. Still, other businesses have sprung up. Small booths sell food and cigarettes, as well as little packets of spices and dried fish. There’s even a market for cosmetics and cheap costume jewelry. The most inspired business idea, though, belongs to a 25-year-old local man who gave only his first name, Jalal. He’s set up a shop to charge cellphones for 5 taka (6 cents) a pop. With no electricity in the camps, his business is booming. 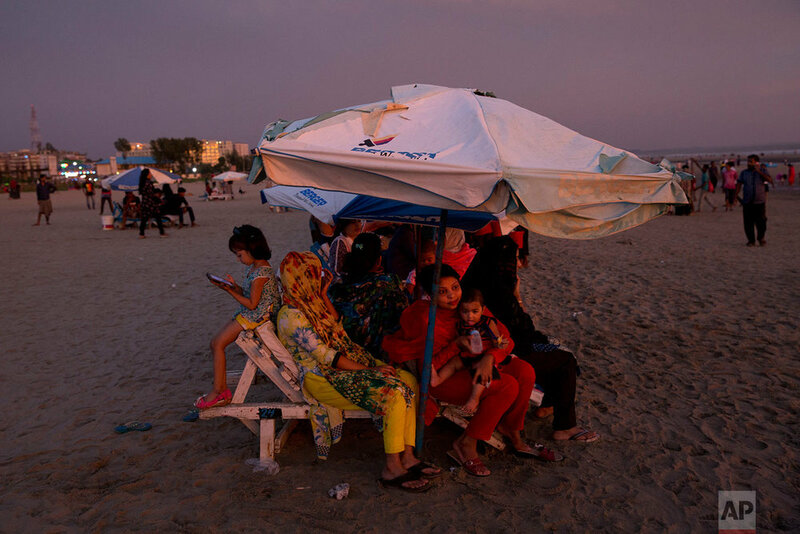 At the beach, the heart of Cox’s Bazar, life remains largely untouched by the influx of Rohingya refugees down the coast. Tourists and residents are sympathetic to their plight, but worried too. Text from the AP news story, ‘Too many people’: Refugee influx worries Bangladesh town, by Muneeza Naqvi.